Maybe some of you noticed by now that I am Swiss. However, I did grow up in upstate New York, thus – although with Bagels and Cream Cheese instead of Donuts – some childhood memories stuck. And well, unless you go to Starbucks, which in Switzerland is endlessly expensive, one particular childhood craving is hard to satisfy. 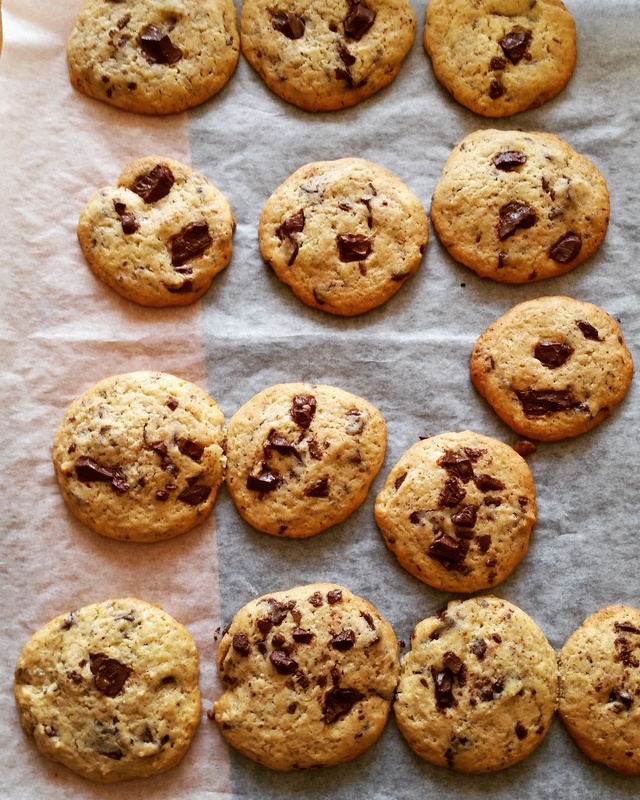 So I decided to make them myself and after a period of trial and error hopping from blog to blog and cursing my oven I finally did it: Delicious, chewy, chocolaty, buttery – in short: the perfect sinful cookies. Before you start make sure you take the butter out of the fridge to let it warm to roomtemperature, otherwise the mixing of the ingredients will be difficult. Also, chop the chocolate in coarse pieces (the size is up to you, I like my cookies to have quite big pieces of chocolate in them) and put it aside. Mix the butter with the sugar, the vanilla sugar and the salt for about 4 minutes until mass gets foamy and clear. Add the eggs and continue mixing for about a minute. Finally, add the flour along with the baking powder and the natron (baking soda) and fold it into the mass until an even dough develops. Fold in about 3/4 of the chocolate and put the dough in a fridge for about 90 minutes (the cooler the dough is, the thicker the cookies stay while baking). Take the dough out of the fridge and form little balls of about 2-3 centimeters diameter (they don’t have to be perfect). Put them on a baking parchment with enough space in between (3-4 centimeters at least) and flatten them a bit with a spoon. Top the flattened cookies with the leftover chocolate pieces to your liking. Insert the cookies into the oven and let them bake for 13-15 minutes. Make sure they do not get too brown, as they might dry out if they do. 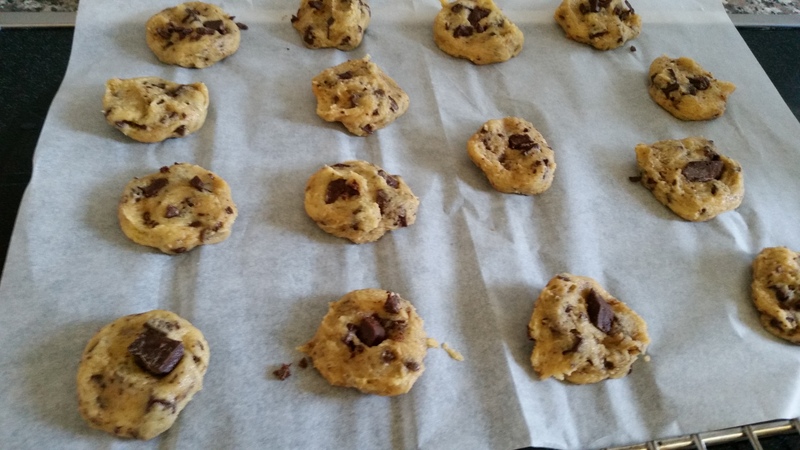 Take the cookies out of the oven, let them cool down and enjoy! Okay…….I’ll take one with my morning coffee. Yum!